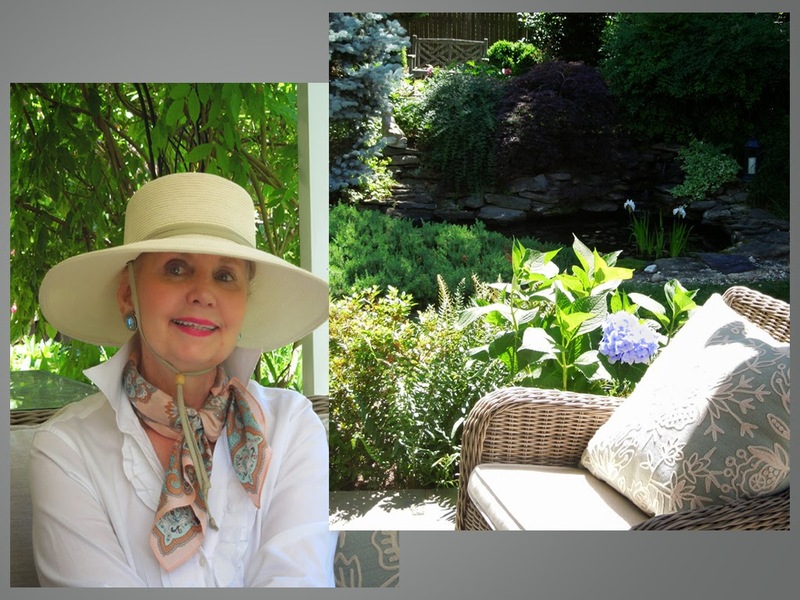 Visiting Bunny Williams + Giveaway! Gosh, how time flies! This is my 100th post! Seems like yesterday when I first sat down at my desk to start this blog. 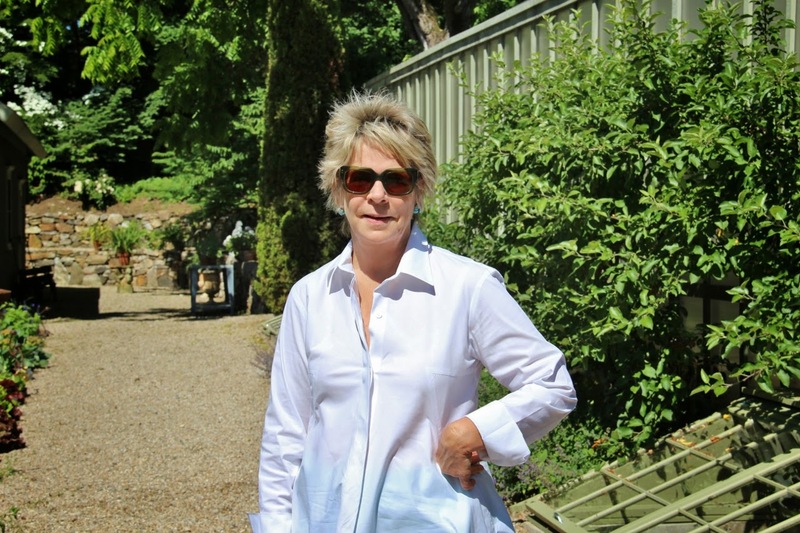 I hope you have enjoyed all the antiques, collections, travel destinations, homes and gardens featured. 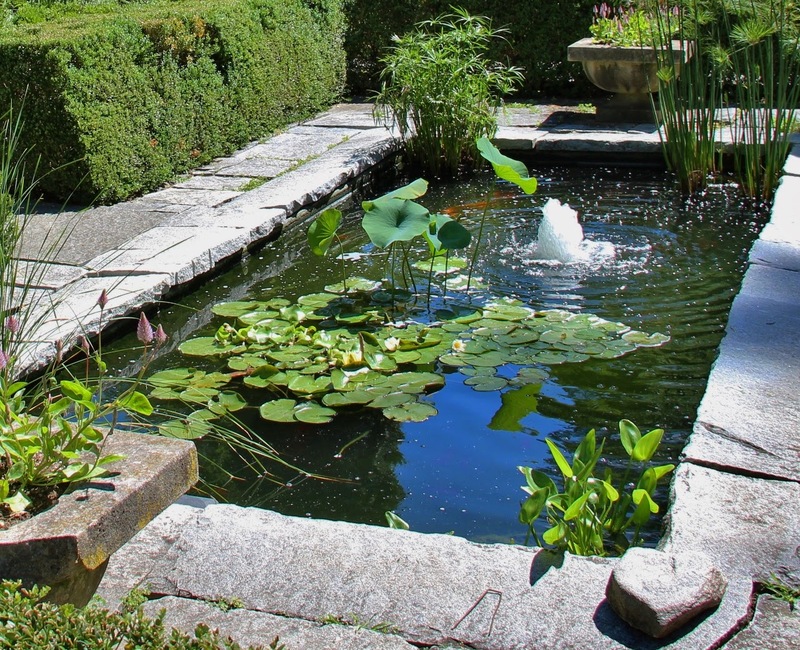 Speaking of gardens, I have a showstopping garden tour to share. 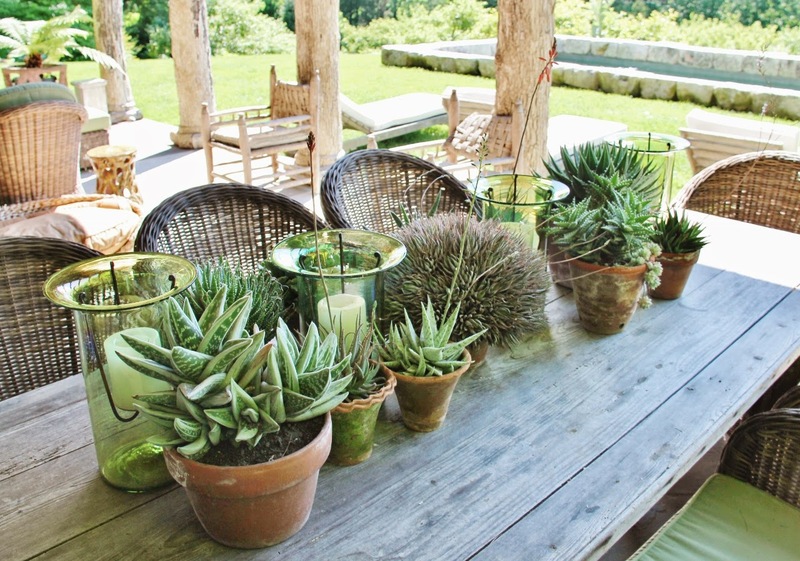 Thanks a million to my good friend, fellow blogger and design colleague, Phyllis Higgerson of Henhurst Interiors, for this special guest post on style icon Bunny Williams' magical garden in Connecticut. And for the giveaway - a signed copy of Bunny's classic, top selling book: An Affair With A House. Phyllis is a brilliant interior designer whose sophisticated work I greatly admire. Enjoy some of her projects on her website, blog and Instagram page - you won't be disappointed! 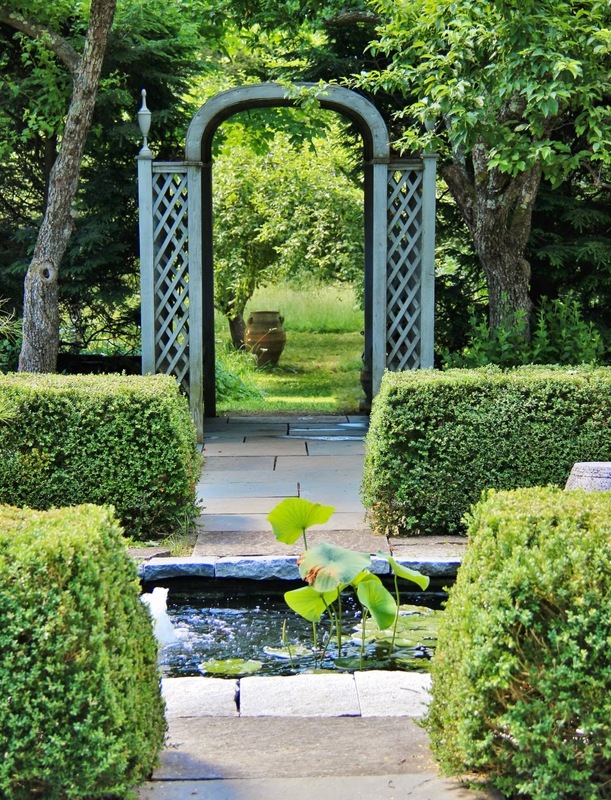 Last weekend I had the pleasure of touring Bunny Williams' Connecticut garden during one of The Garden Conservancy's Open Days in Litchfield County. 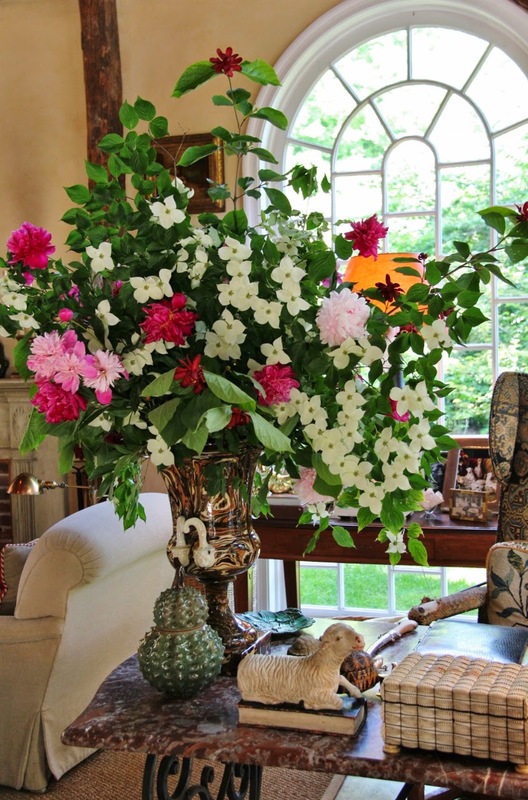 It was a perfect early summer morning and a joy to explore the varied gardens that surround the house as well as viewing some of the interiors. I came away with a lot of inspiration, and I am thrilled to be sharing here today at Tone on Tone. 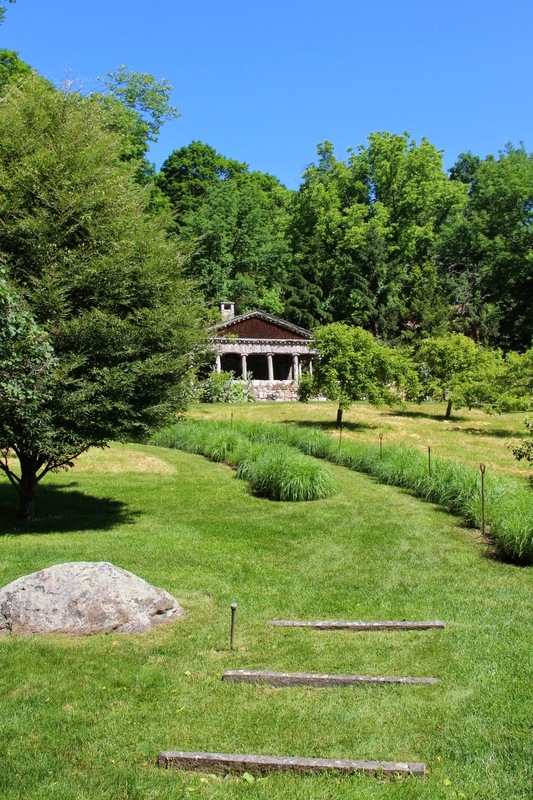 The property features two formal gardens (a sunken garden with a lovely water feature and a boxwood parterre), an expansive cutting and vegetable garden complex with an extraordinary chicken coop, woodland trails complete with a cool, bubbling stream, a fruit tree orchard and a classically-inspired pool pavilion with a knock-out view. Let's begin. 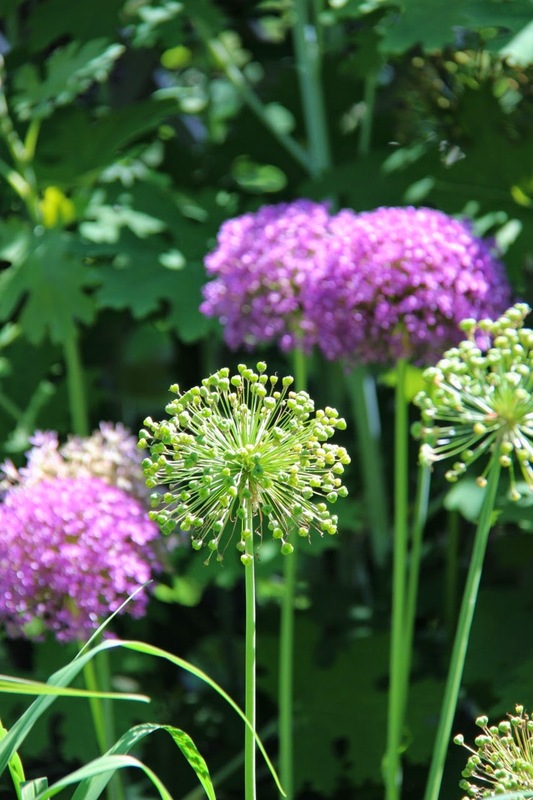 Currently blooming amid clipped evergreens and boxwood spheres in the sunken garden to the left of the house were loads of alliums. 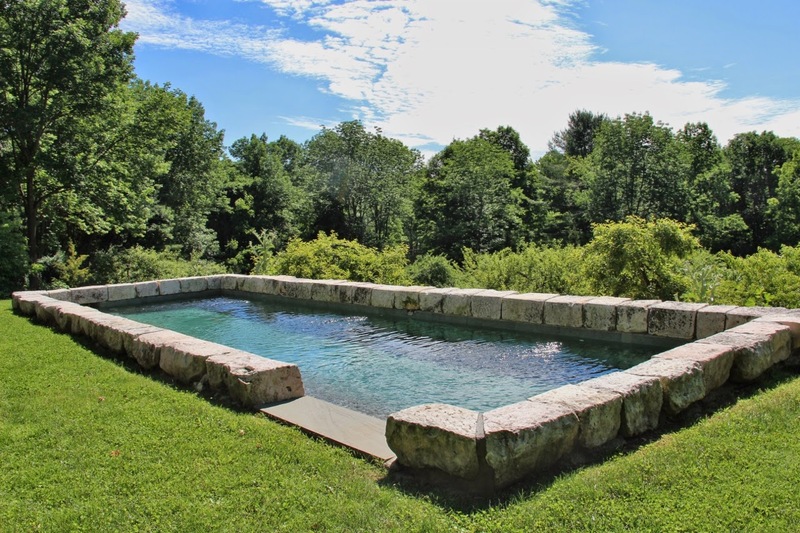 A view across the small pool filled with koi and water lilies to a field cut with trails and dotted with birdhouses. 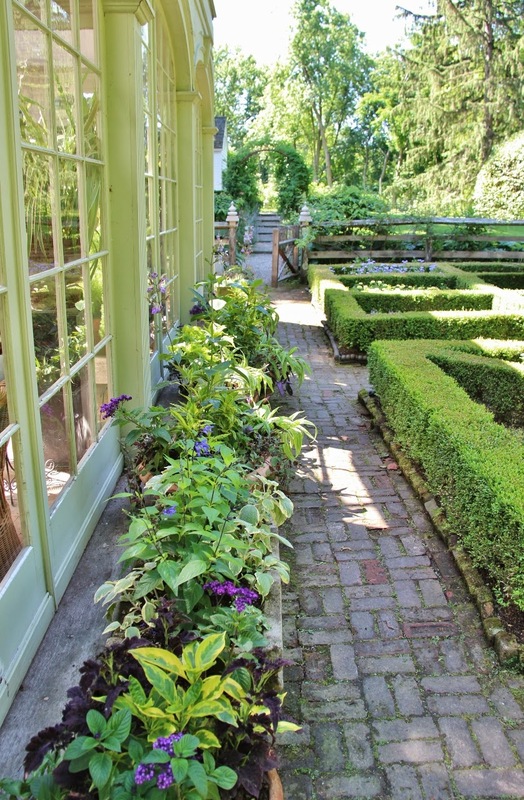 The terrace at the back of the house featuring potted boxwoods. 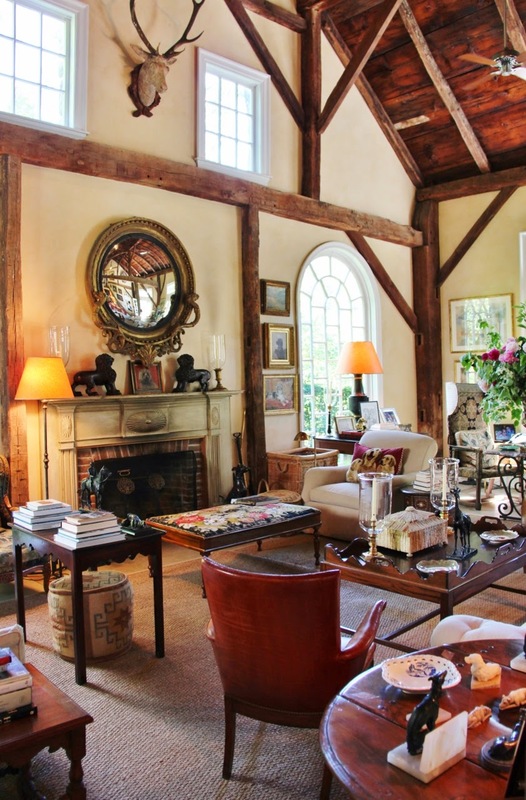 To the right of the house is the barn, a spot for entertaining guests or finding a quiet place to read. 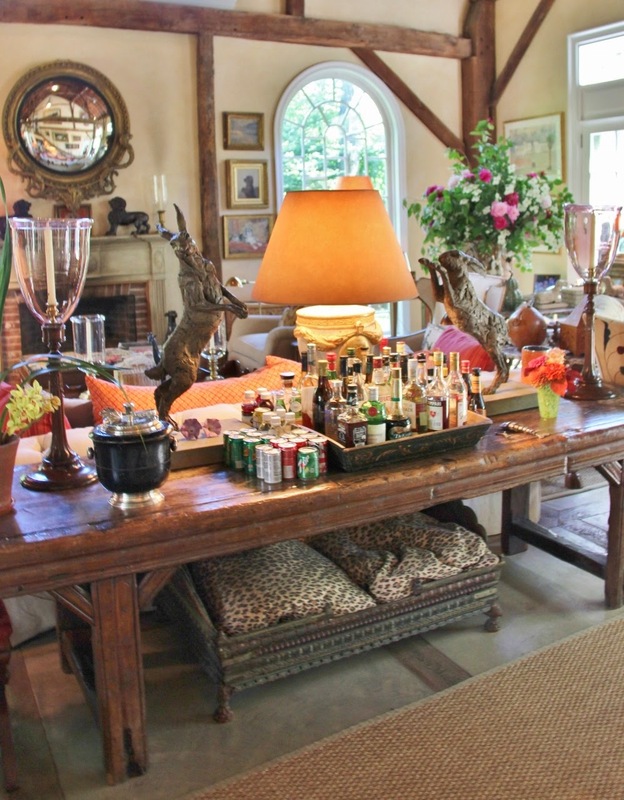 Two things about Bunny Williams that became readily apparent during my tour: she is the consummate hostess and her dogs are truly part of the family. They are welcome everywhere and their comfort is always considered. 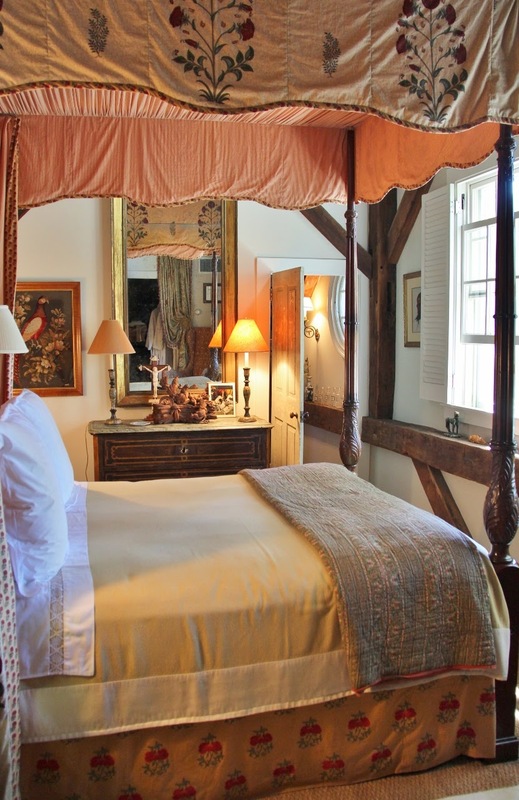 The guest room in the barn loft. 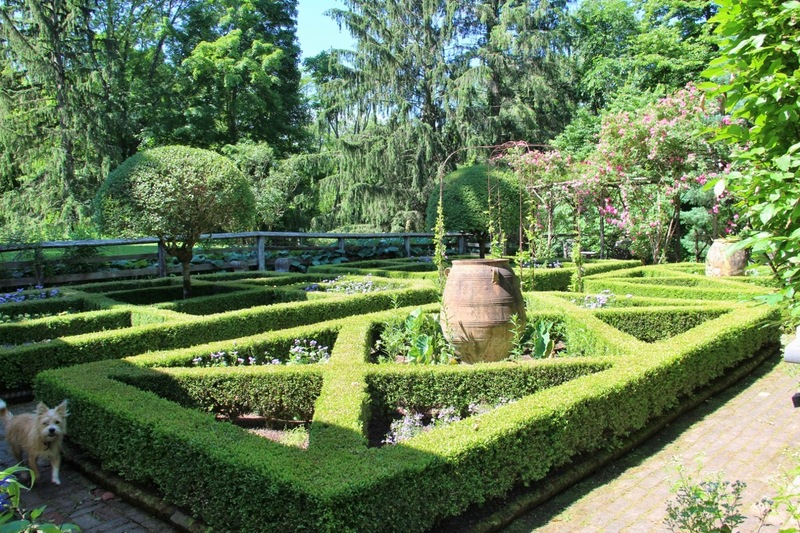 The parterre garden behind the barn. 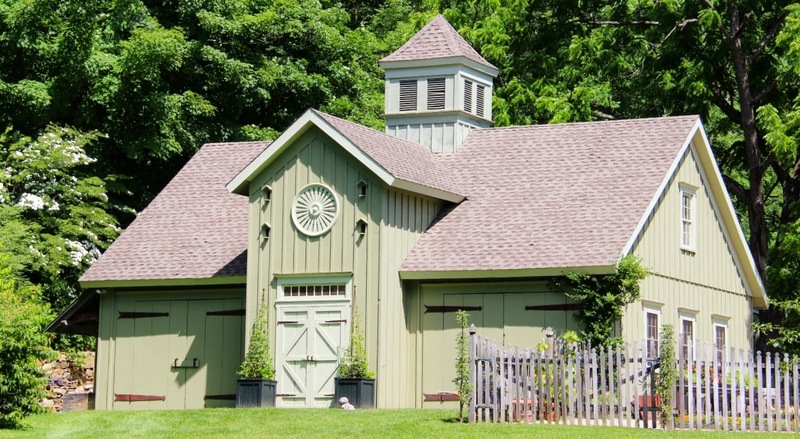 The structure on the left side of the photo is the conservatory attached to the back of the barn. 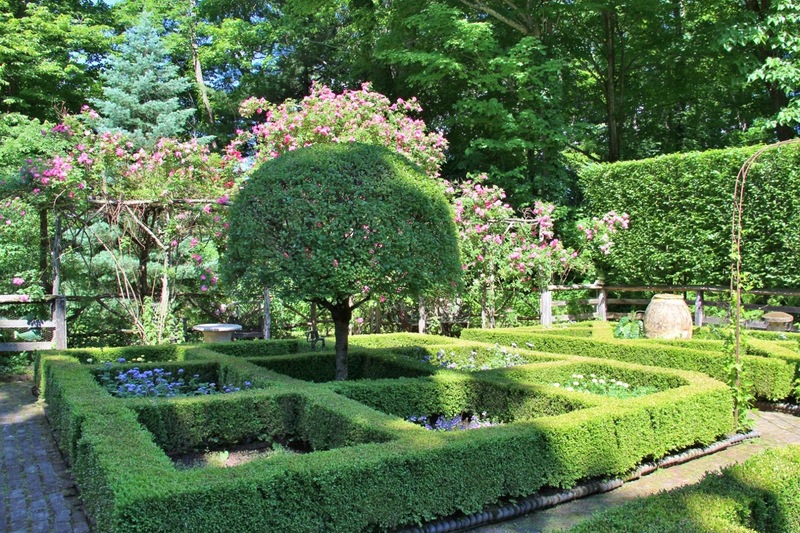 A hornbeam hedge forms a wall on the other side of the parterre. 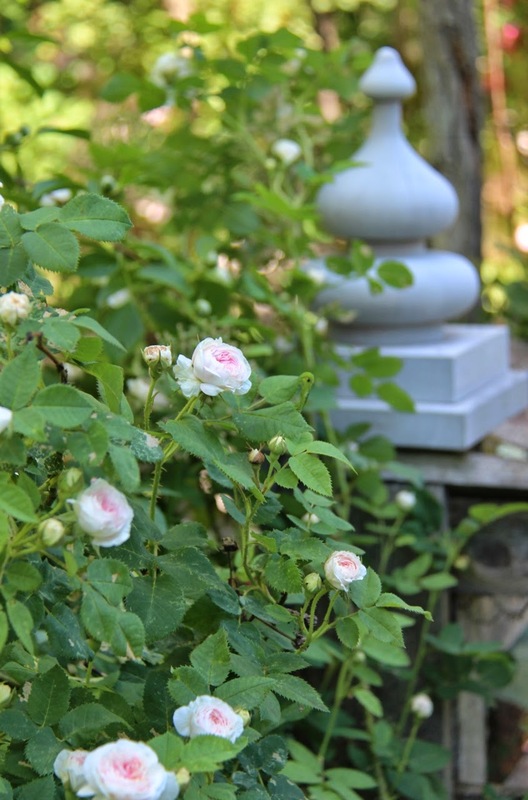 At the back is a rustic pergola covered in climbing roses. 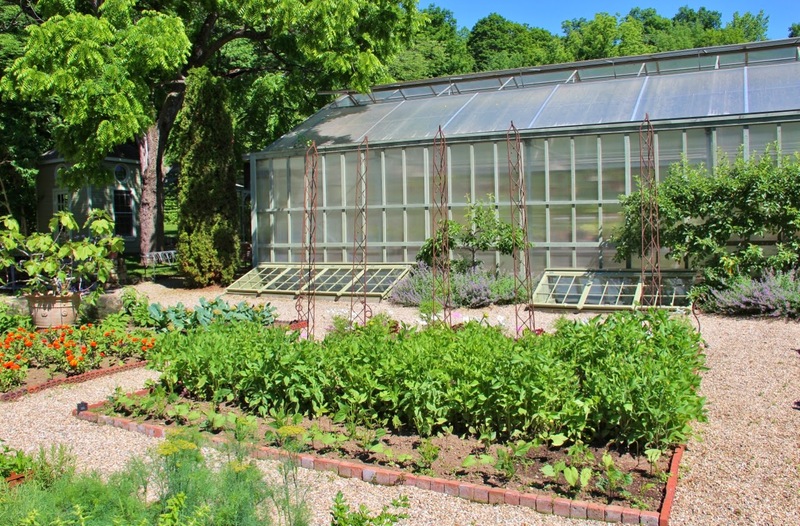 An expansive green house over-winters exotic and tropical plants and the potted fig trees currently positioned around the garden. 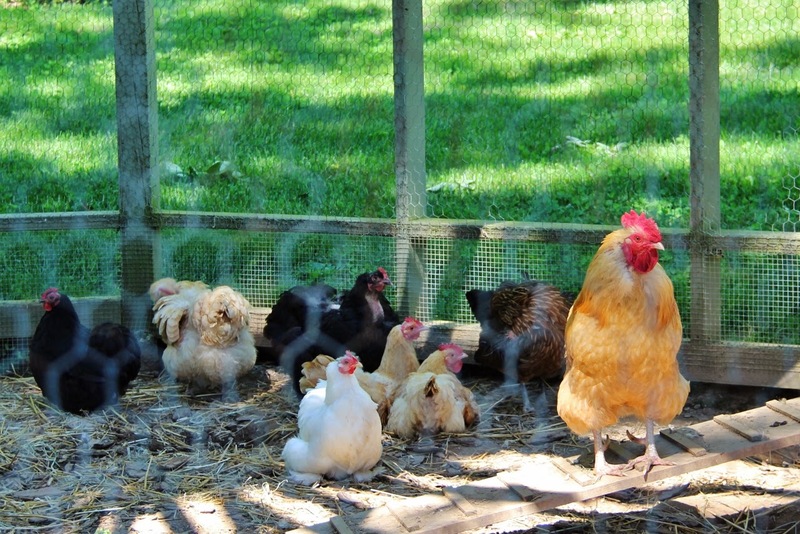 Bunny mentioned the chickens are her husband's passion. 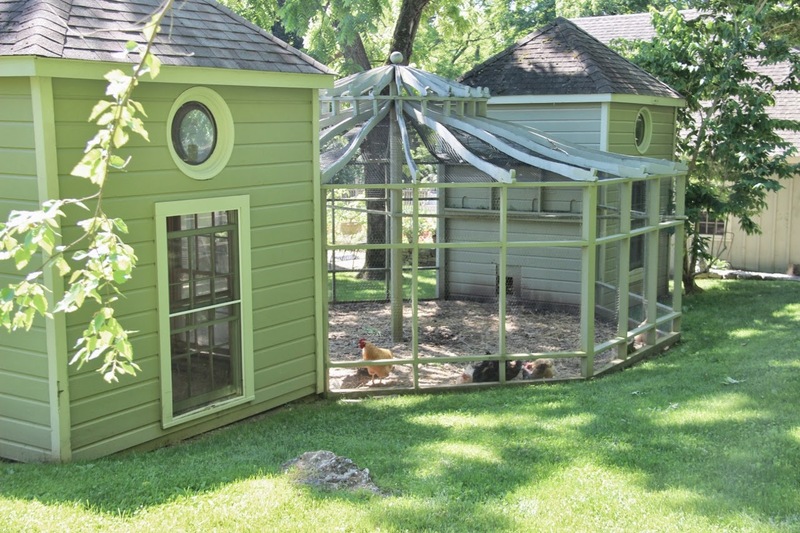 They certainly live in high style at the aviary. 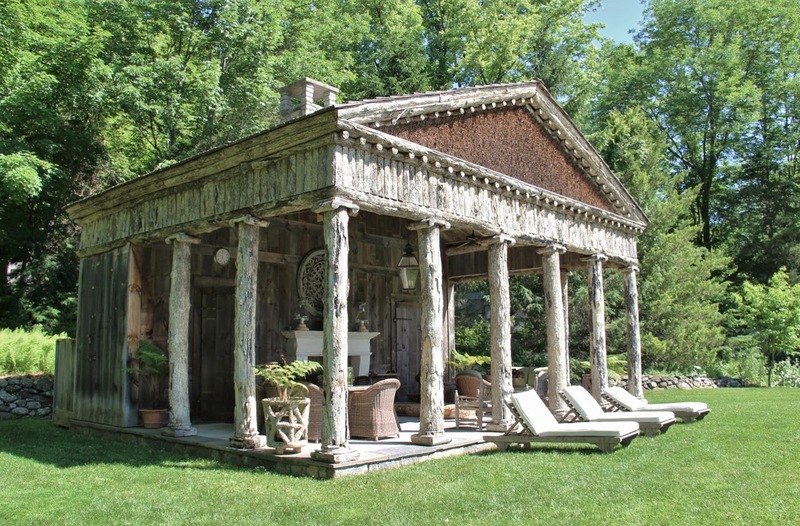 The pool house was inspired by an 18th-century French garden folly and built to the exact proportions of a classical Greek temple. The building is also equipped for entertaining with a small kitchen and bar. It is a magical spot. 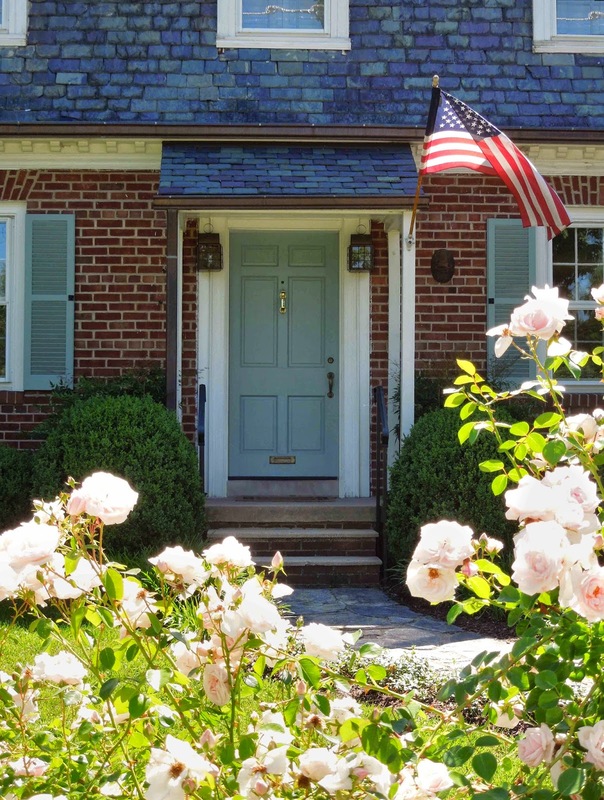 Many thanks to our gracious hostess who warmly greeted visitors, made sure we saw everything, and spent time answering questions and signing copies of her books. 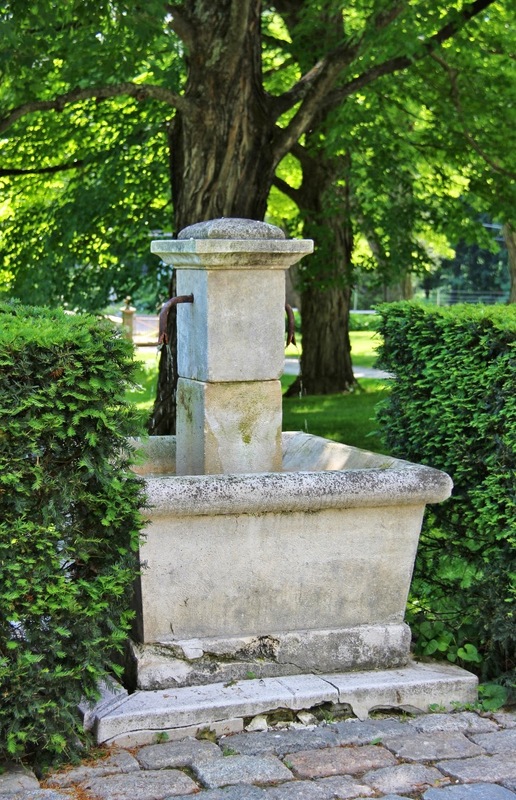 Much more detail about the garden can be found in An Affair With A House. 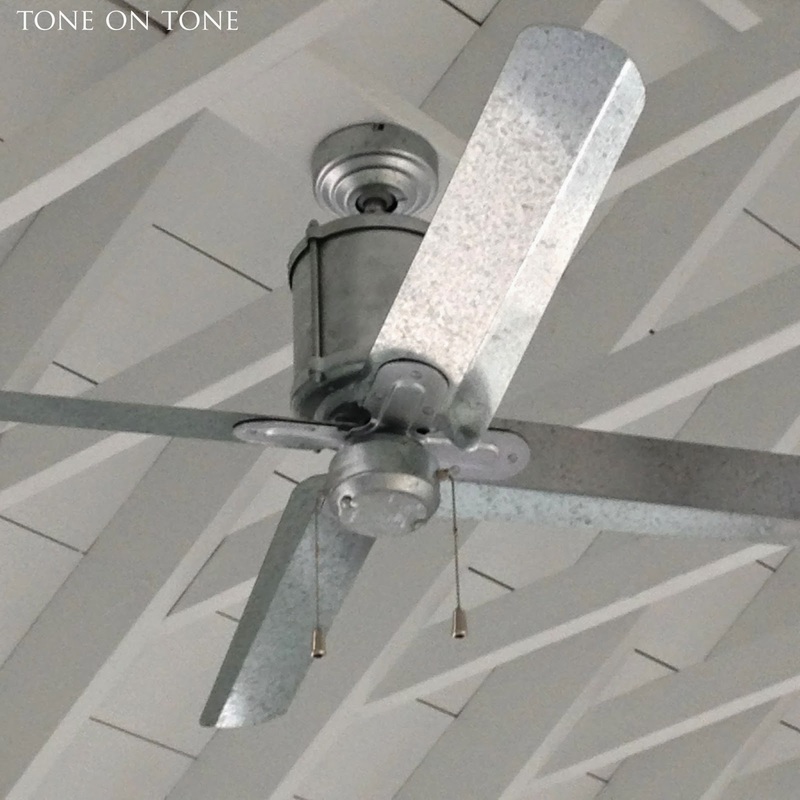 And many thanks to my dear friend, Loi, for welcoming me to contribute to Tone on Tone. 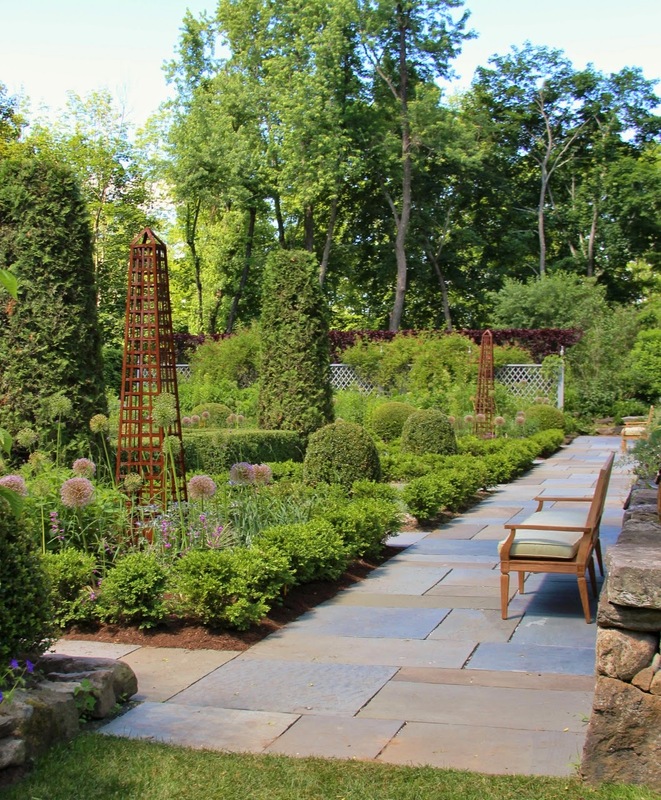 For more information on visiting Open Garden Days throughout the country visit the Garden Conservancy. Wasn't that a lovely tour? 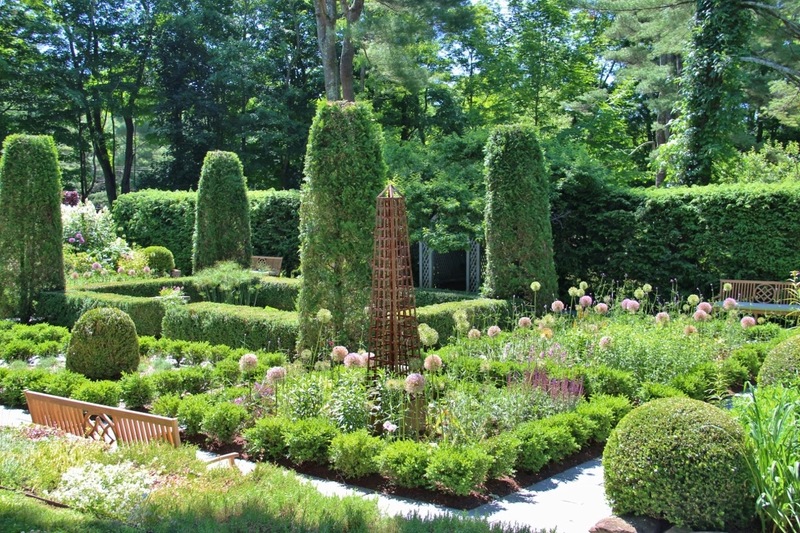 Such incredible ornaments, structures and plantings! 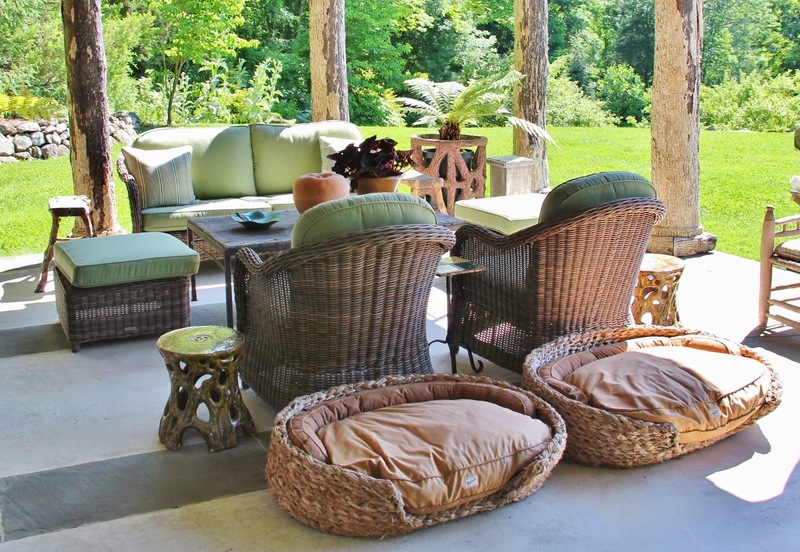 I love all the "outdoor rooms." Many thanks, Phyllis!! As mentioned, we have a signed copy of An Affair With A House to give away. Just leave a comment (one per person), and we'll pick the lucky winner via Random.Org on July 8th at 8:00 PM Eastern time. The giveaway is open to all, and the book will be shipped free of charge. Stylish entertaining is an art. 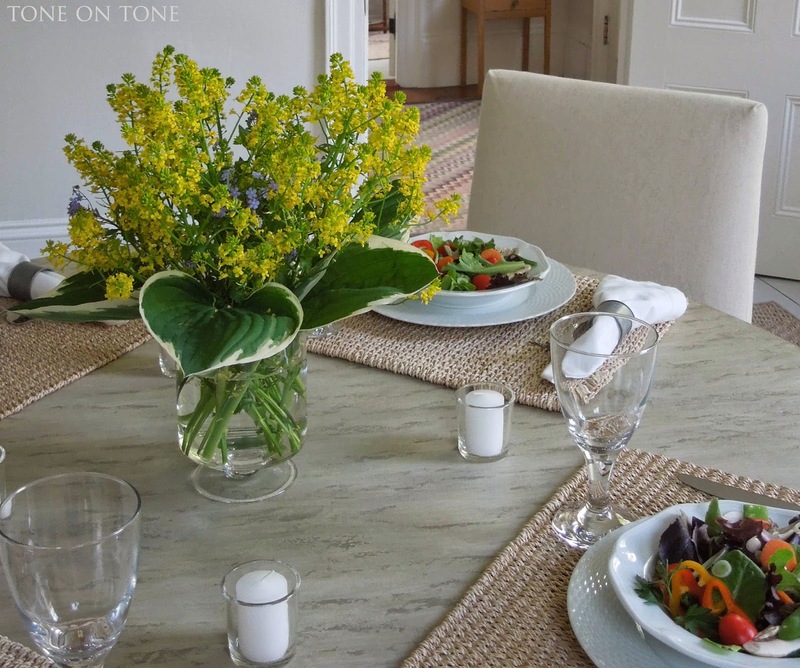 For Michelle Pangallo, my good friend and client, setting a gracious table, creating beautiful floral arrangements and whipping up mouthwatering courses all come naturally. Together with her husband CD, they are the ultimate hosts! 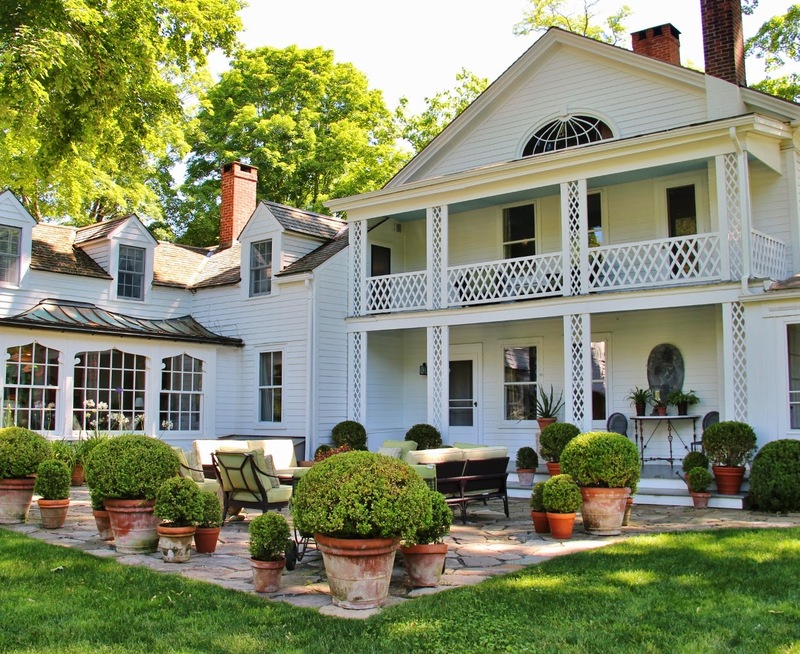 I recently attended a splendid luncheon at Michelle and CD's Swedish style cottage. 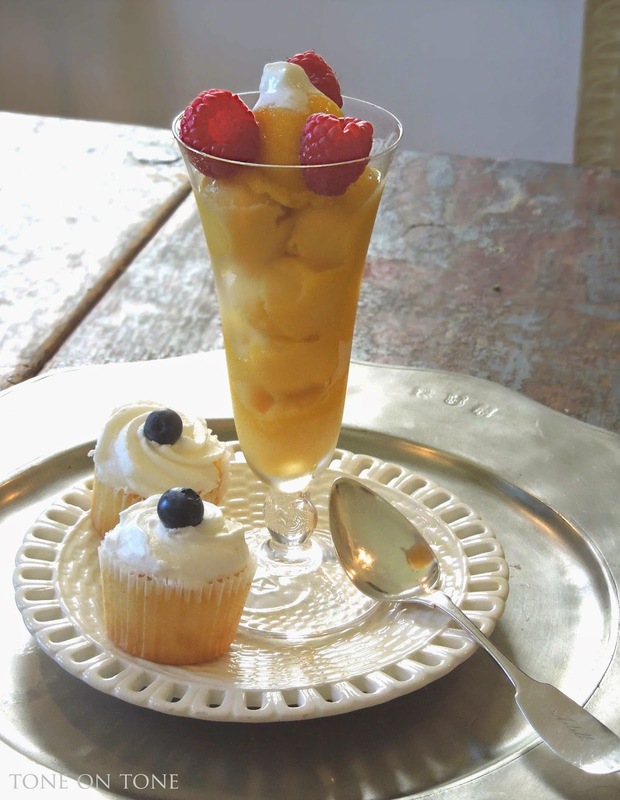 Yes, I devoured every delectable morsel :) I want to thank them for a glorious afternoon, and for allowing me to share the luncheon with my readers. Their hospitality was truly world class. By the way, if you recognize the house, good eye! I've written about it here and here. There are some new acquisitions, tweaks and seasonal changes. Shall we revisit Michelle and CD? 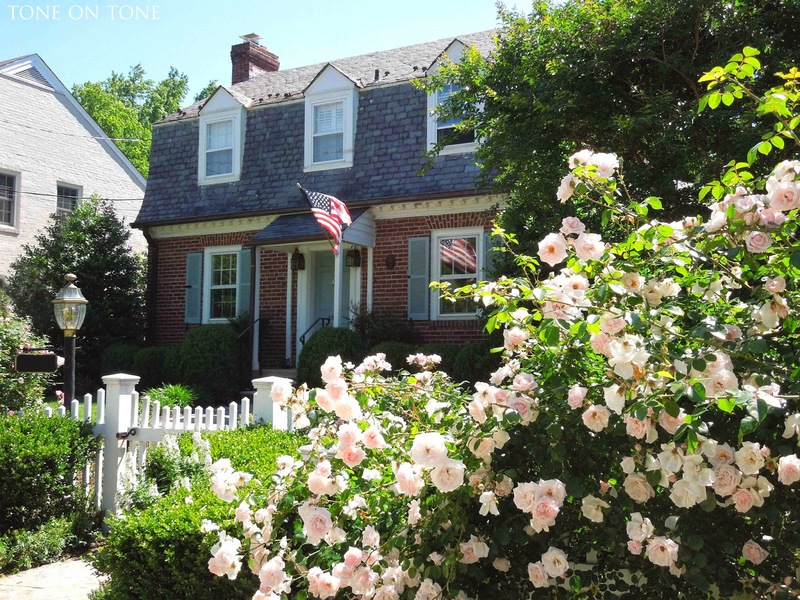 Guests are greeted by an abundance of roses climbing over the white picket fence. 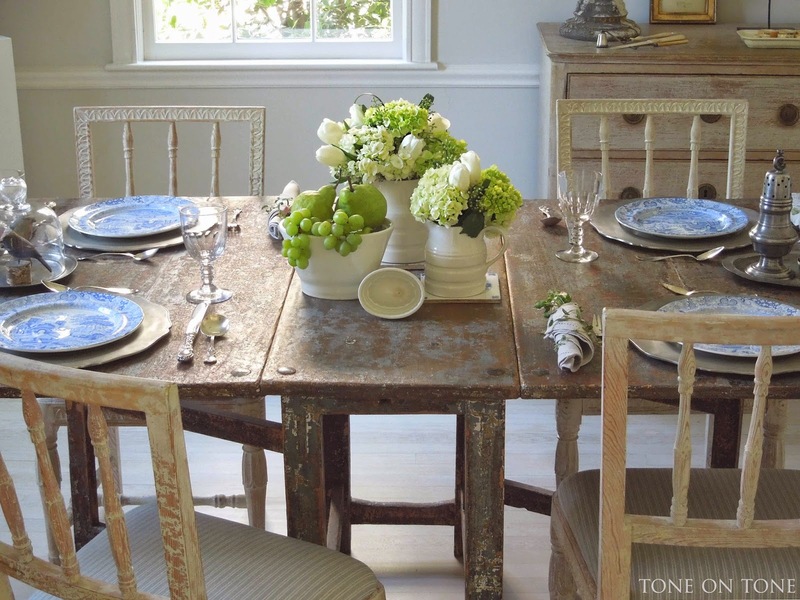 Such an inviting Swedish style dining room! 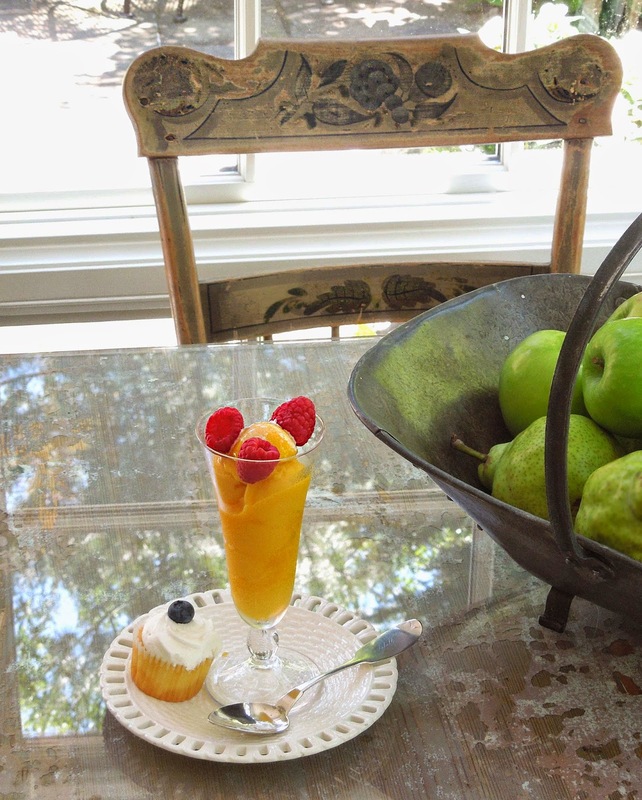 No one sets a prettier table than Michelle, who confidently mixes garden flowers, seasonal fruit, humble pottery, new and old pewter along with antique silver and china. 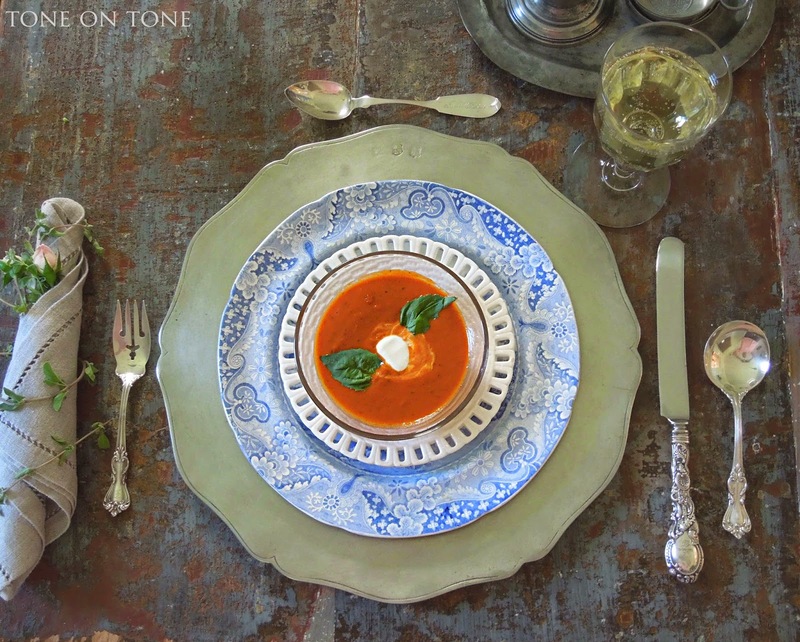 19th century English Spode transferware, white ironstone jugs and creamware jelly molds are from Tone on Tone. The pewter chargers are from Match. 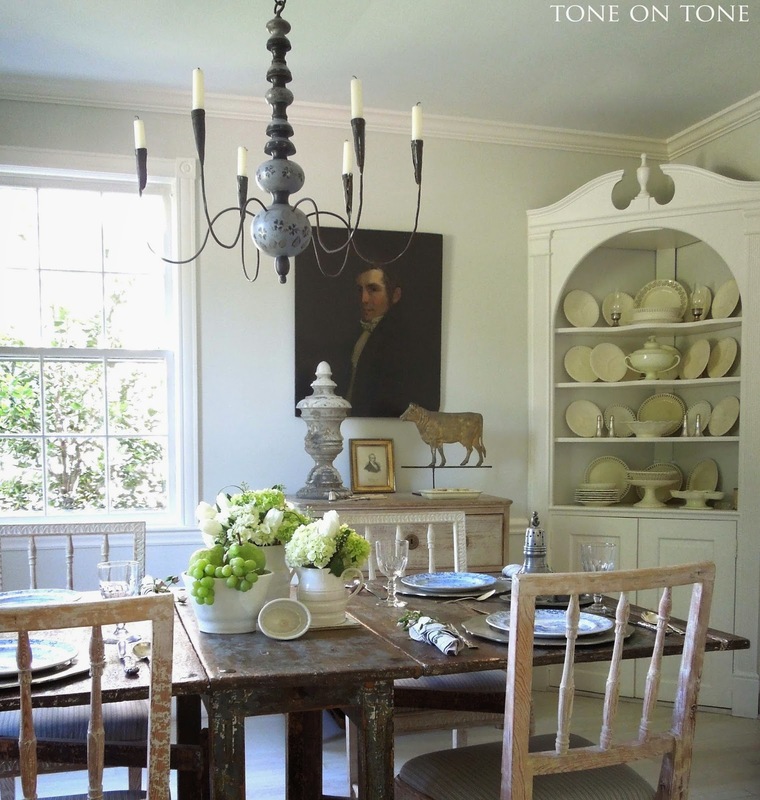 Appointed with Swedish furniture from the 1780 - 1810s, the dining room feels fresh and airy thanks in part to the bare, bleached floors and light-gray walls painted in Benjamin Moore's Classic Gray. 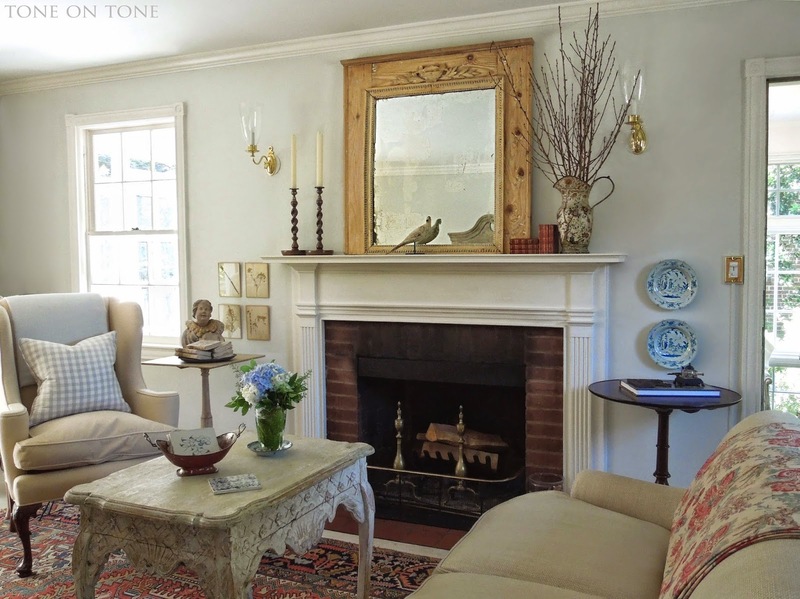 The Gustavian chairs are from Tone on Tone, and they are upholstered in Palmerstone by Classic Cloth, Dessin Fournir. For the first course, a velvety tomato-basil bisque with a dollop of creme fraiche. Michelle rolled the linen napkins with roses and marjoram - the scent was heavenly! 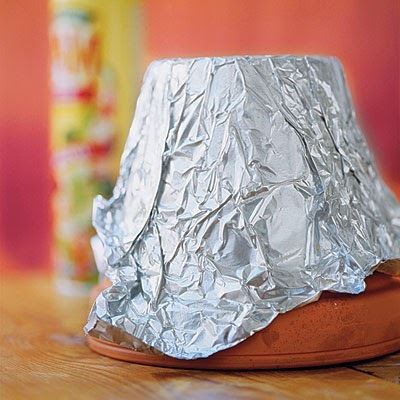 -Wrap outside of an inverted 6" terra-cotta pot in aluminum foil. Use a clean pot, of course. -Coat foil with vegetable cooking spray. -Place a 12" square of parchment paper on baking sheet. -Spread 1/2 cup shredded Parmesan cheese onto parchment paper, patting it into an 8 1/2" circle. Grated cheese will not work for this recipe! -Bake at 375 degrees for 5-7 mins or until pale golden. -Remove from oven, and let cool 10 seconds. -Carefully lift parchment paper off baking sheet. -Working quickly, invert Parmesan circle over the prepared pot. 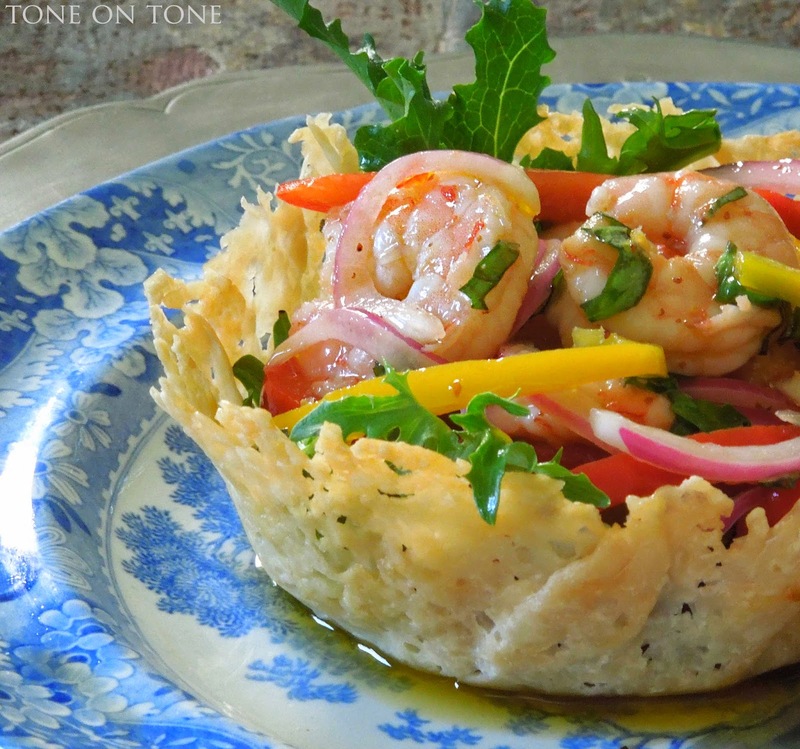 -Carefully remove parchment from Parmesan circle. -Gently press cheese over inverted pot into desired bowl shape. Tip: If cheese circle is too hot, it will slide down the pot, causing small tears. If this happens, gently press the cheese together to seal any large gaps. 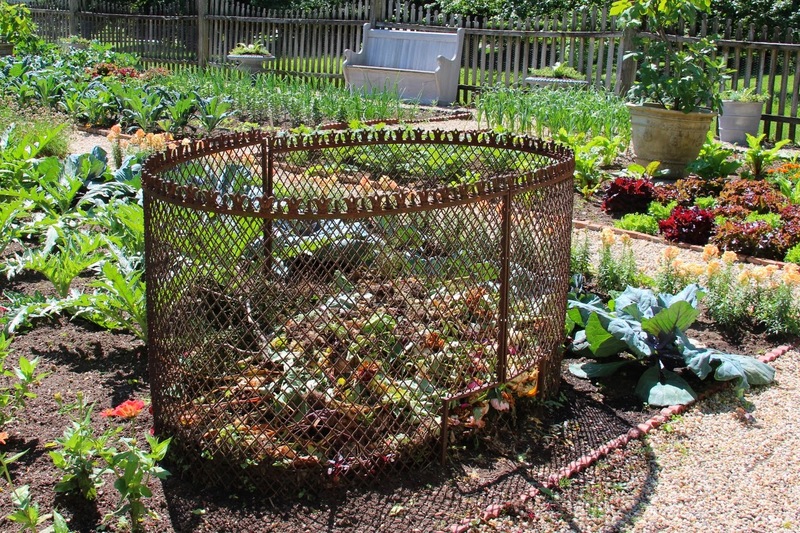 -Cool basket completely (about 5 mins), and remove from pot. -Repeat to create as many baskets as you need. It's important to work quickly to shape them when they come out of the oven, so make one at a time. You can bake these a day ahead, and store them individually in Ziplock bags. 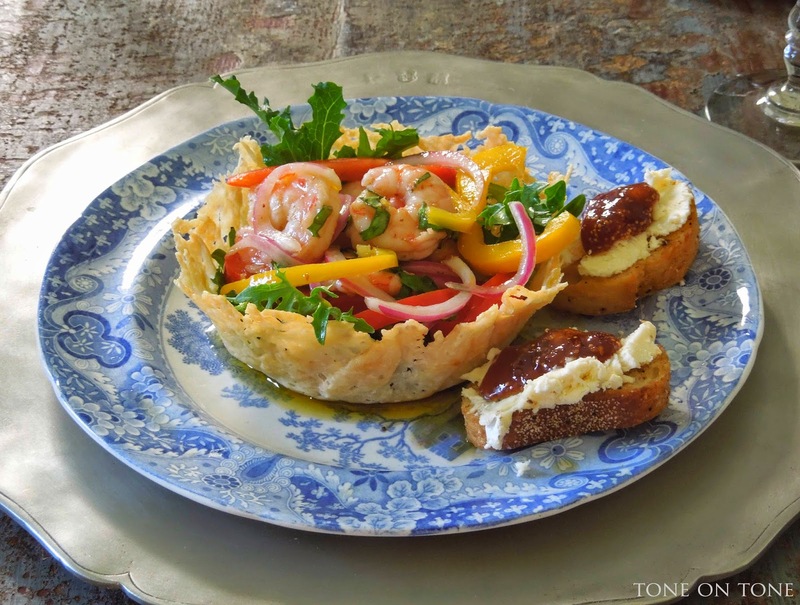 For the lemon-basil shrimp salad recipe, go here. 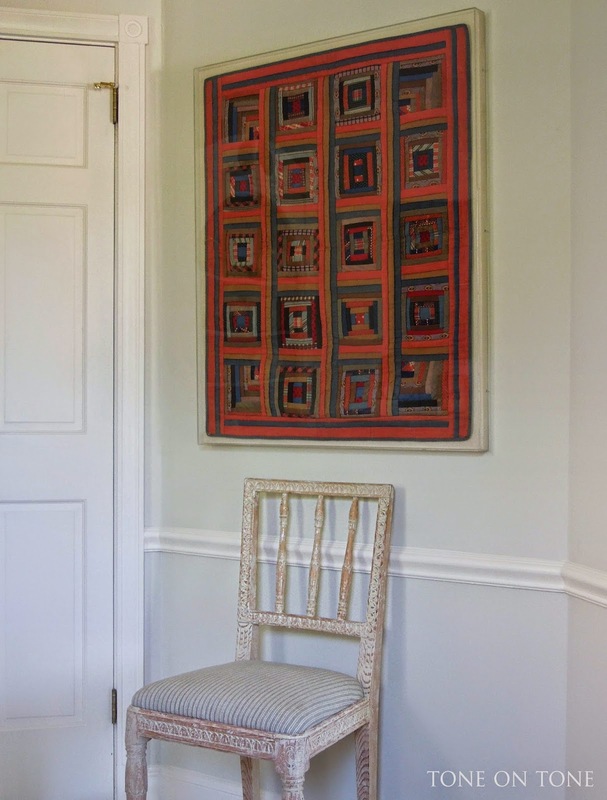 Let's pause before dessert and check out the latest addition in the room: a 19th century American child's quilt in a log cabin pattern - notice how no two squares are alike. Also, look at the vivid colors and graphic lines. It's what I call folk art with a modern spirit. The quilt came from Beverly Norwood Antiques in Maryland. 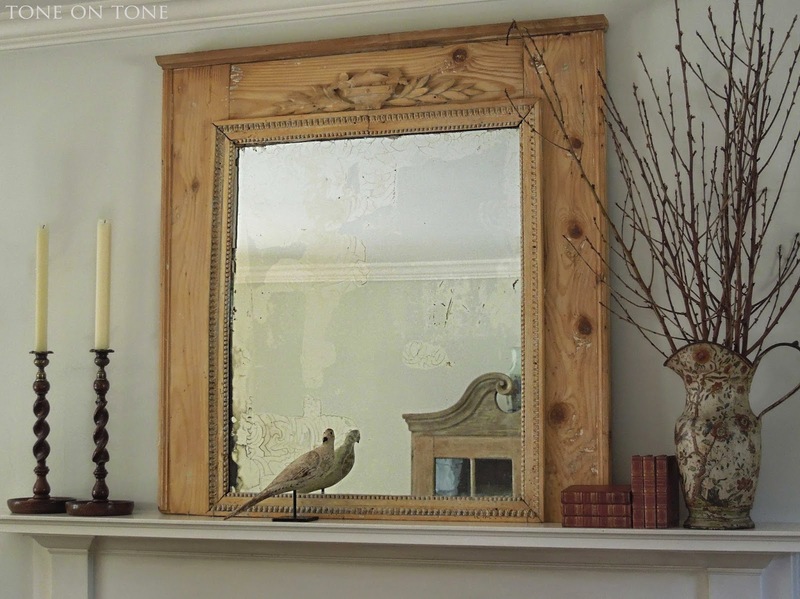 Another new piece is the 18th century French trumeau mirror from my current shipment. When I found this mirror, I knew Michelle and CD would understand and admire its stripped down pine surface and patinated mercury glass. I suggested it for the living room mantel, and we all love it! 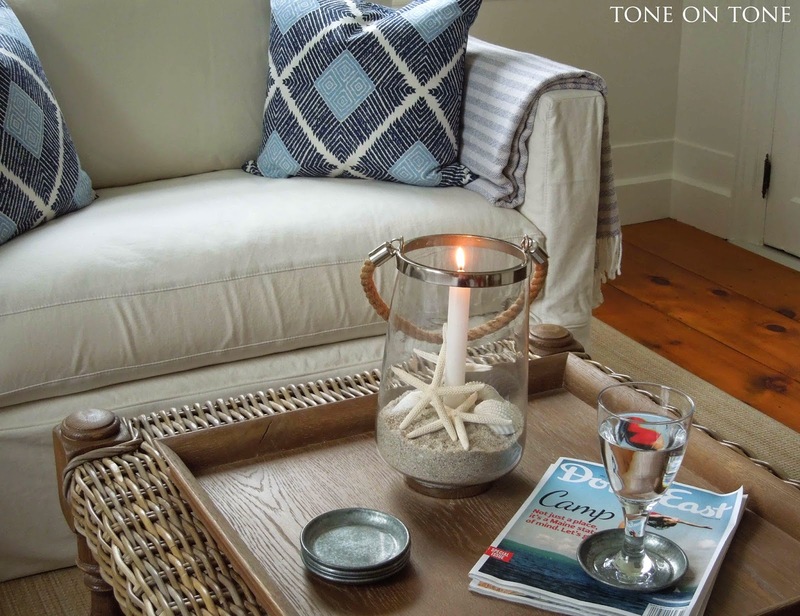 The mirror's humble charm is an unexpected contrast to the richly carved Swedish tea table, also from Tone on Tone. A sweet arrangement of hydrangeas with hyacinths. 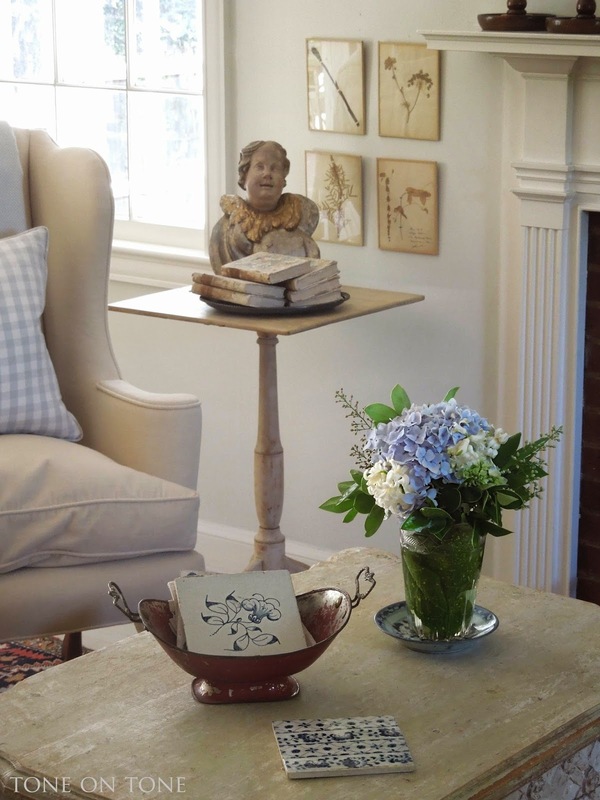 Michelle likes to use antique Delft tiles as one-of-a-kind coasters. It's always great fun to select just the right one! My warmest thanks to Michelle and CD for a special afternoon filled with delicious food, lots of laughter and many lovely moments. This is such a glorious time of the year. The garden is lush, days are long and weather blissful. I'm trying to savor every minute and not rush, too quickly, into summer. Tom and I recently went to Maine to open up the house for the season. The weather was cool but comfortable. It was a welcome surprise to see forsythias, daffodils and azaleas in bloom. I really enjoyed this "second" spring! 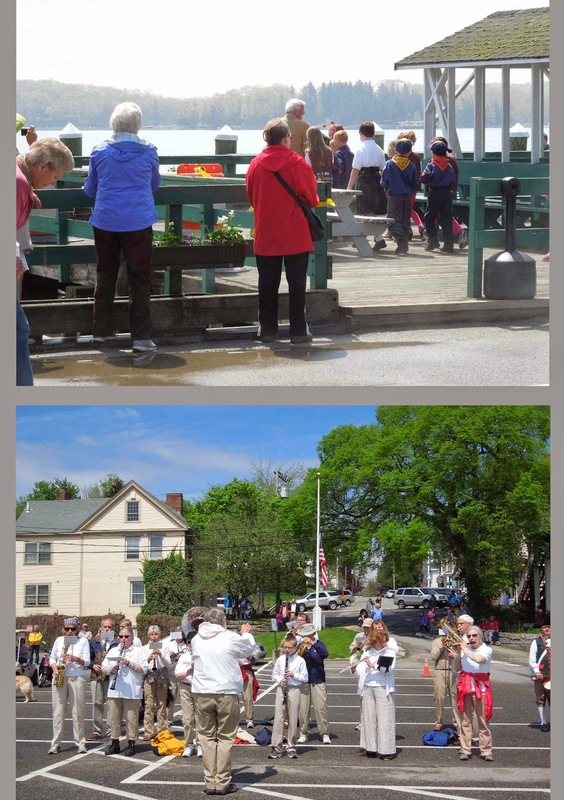 On Memorial Day, Tom and I ventured out to our town's annual observance, which opened at Castine Cemetery, then moved to the Town Common, and finished at the dock with a wreath cast upon the waters in honor of the naval veterans. 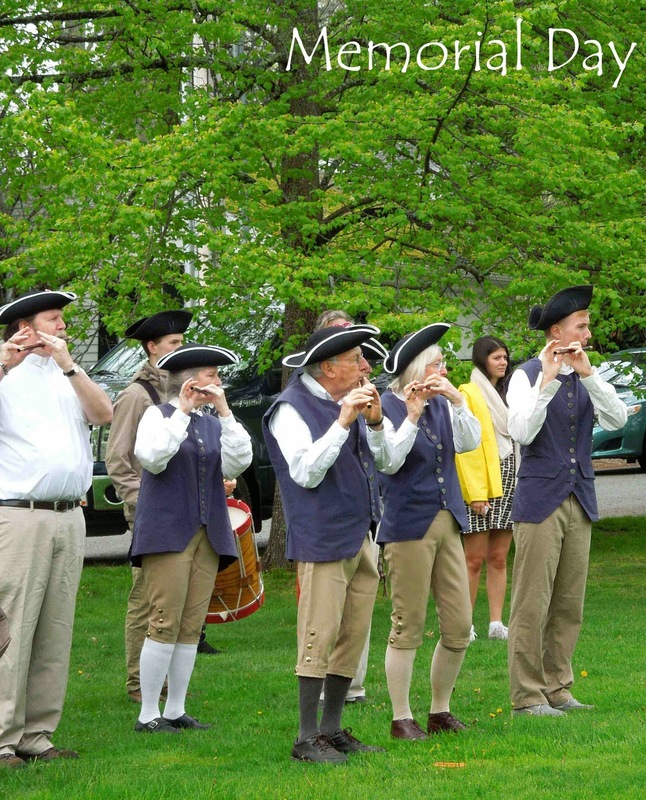 All of Castine came out to pay tribute to the fallen heroes - it was very poignant. 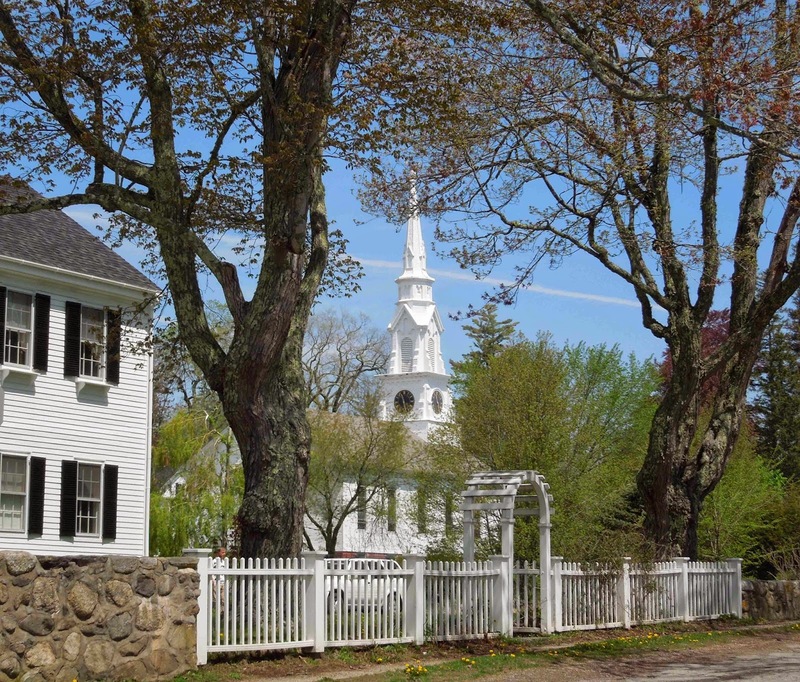 A beautifully framed view of the 1829 Trinitarian church in Castine. 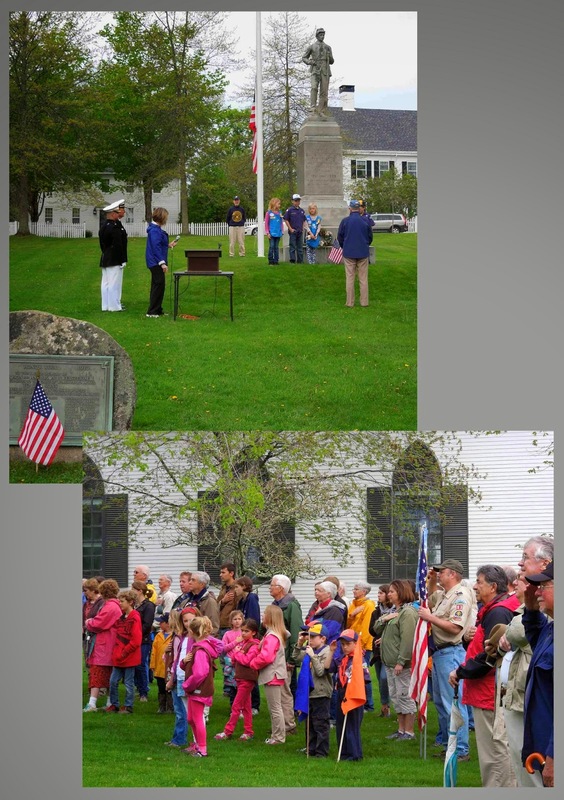 Veterans, cub scouts and residents observing Memorial Day on the Town Common. BELOW: Well done, Tarrantine Fifes & Drum Corps! Closing tributes on the dock. With summer in the air, I created this inexpensive hurricane piece inspired by an image on Pinterest. 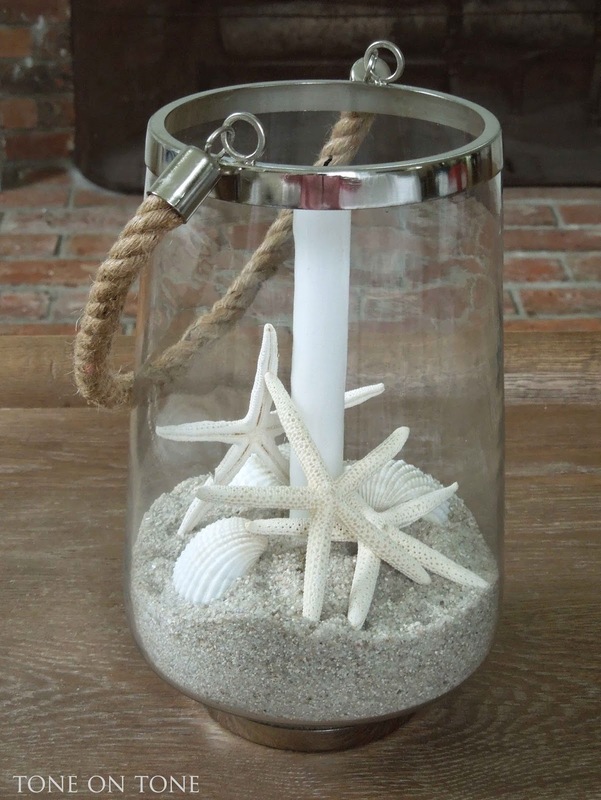 Use plenty of sand as it helps to keep the candle in place. 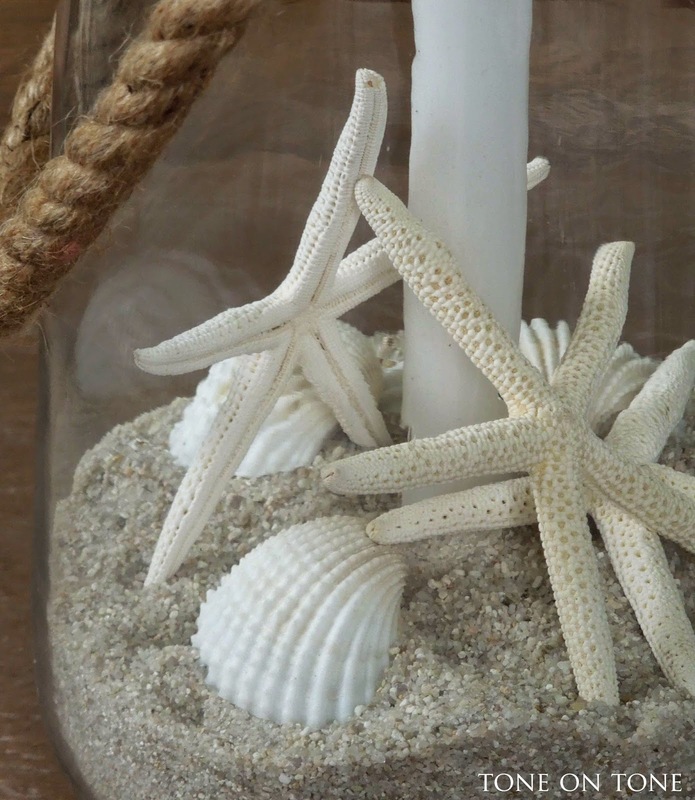 And, of course, be mindful of the burning candle - you don't want burnt shells and starfish! I'm currently loving all things galvanized. 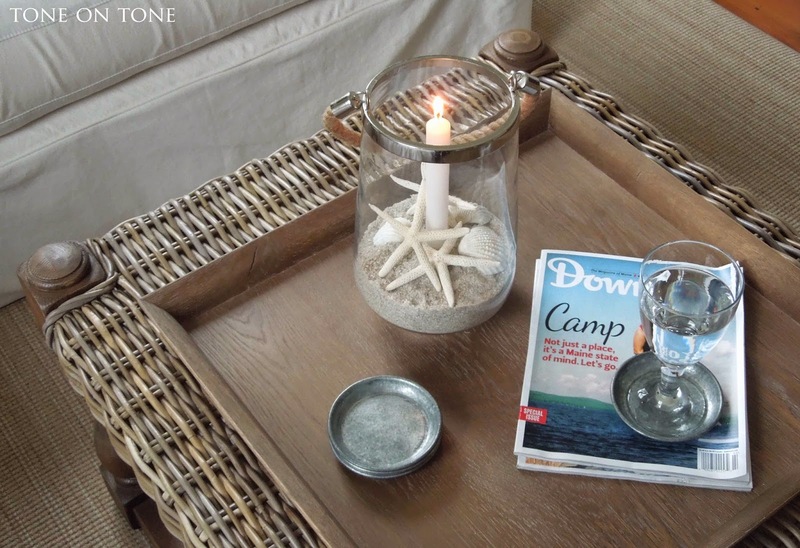 Found these small galvanized candle trays at a local garden shop and thought: cool coasters for Maine. Its lipped rim is purrr-fect for containing water / condensation. The footed wine glass is from Ikea. 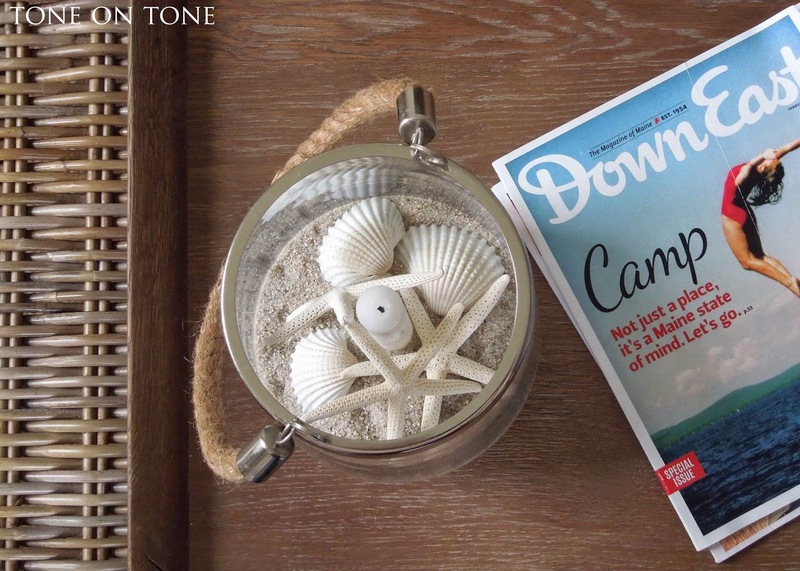 And speaking of love, I'm crazy about Down East magazine - highly recommend it! 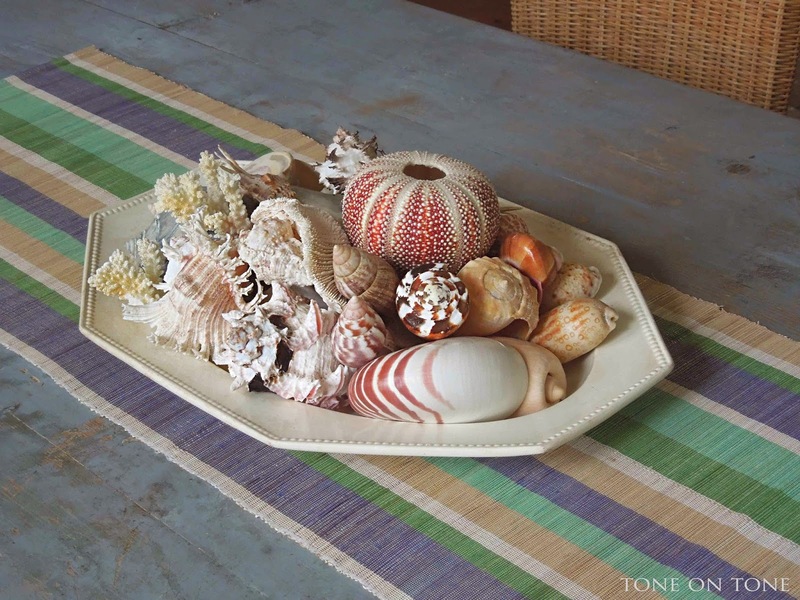 Placing part of my shell collection on an antique creamware platter over a runner from Target. The runner reminds me of Japanese tatami mats. 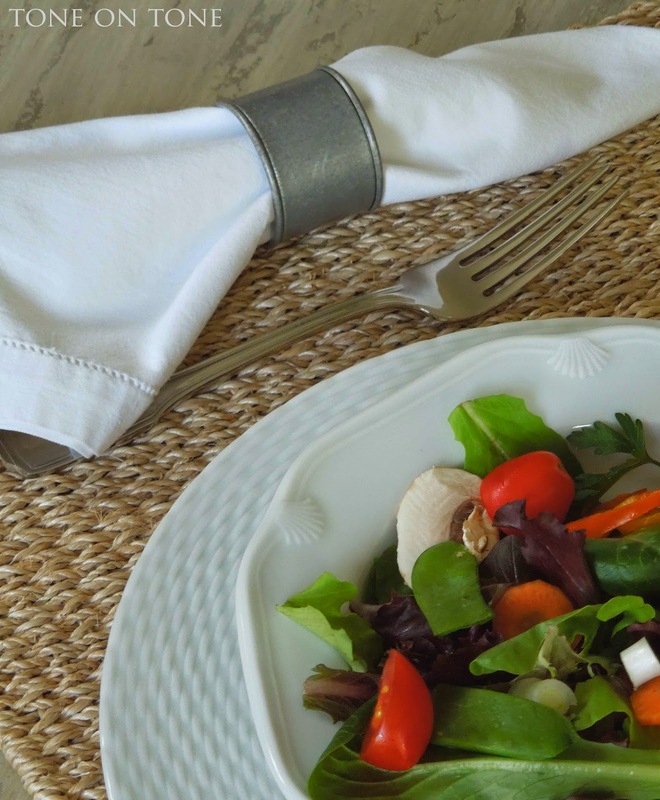 An organic salad to start supper. Everything is simple and unfussy including the wildflowers from the garden in a footed hurricane as vase from Walmart. Yes, Walmart :) The Williams Sonoma white dishes are in different patterns. This is the only set of china in the house, and I like how it can go from casual to formal-ish. Galvanized napkin rings are from Crate and Barrel. Not overly fond of ceiling fans but we need air circulation in the screened porch. I found this very cool industrial fan from Barn Light Electric, and it's galvanized - what a bonus! BTW, I had the drywall ceiling removed to expose the beams and rafters. 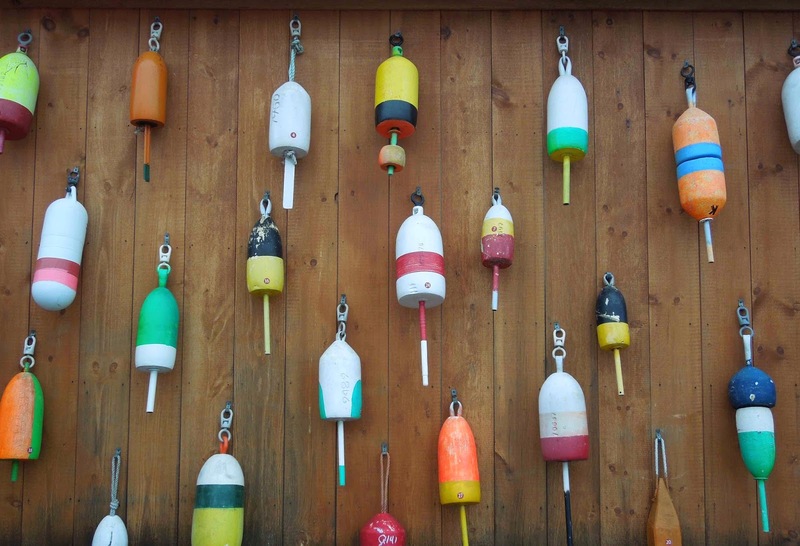 Ending this post on a colorful note with the bouy wall from Carrier's Mainly Lobster in Bucksport.